Is cycle camping the very best form of ethical green travel? There’s something happening in the world. It may be global warming or it may just be a bout of extreme weather. We know that oil is getting harder to find and we know that shale oil is a ghastly proposition bringing mayhem and destruction to the landscapes where it is found. We know that China is now experiencing what the north of England once went through - a full blown industrial revolution polluting and scraping bare the earth’s surface. And yet most people still think that a holiday needs to involve an aeroplane flight, it must be at least 2000 miles away and that everyone can do this - blissfully unaware of the consequences. The hotels and motorways that get built to accommodate these tourists are just seen as a normal part of the foreign landscape. 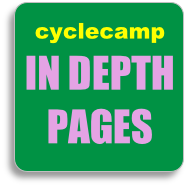 Here at cyclecamp we do things differently. We believe that if you want to explore the world properly you need to get on your bike. And the bit of the world that needs to be explored first is your own backyard – the countryside, villages and towns that lie just beyond your horizon. Not far from where you live are places that you have never seen before. And you certainly haven't seen them from the vantage point of a bicycle or camped in the fields around about. This is the best kind of holiday: no dash to the airport, no polluting car, no carbon footprint, no damaging the local culture and ecology. Just you, your bike and a keen eye for what's interesting and new. For a young person to venture out on their own or with friends into their own countryside on their bike is just magic. For an adult to do it, with or without the kids in tow, is a wonderfully gentle and reflective experience – a new way to get to know yourself and your family. It’s cheap too. You set off from your own front door – the holiday starts there and then. Or maybe take a train ride – it’s not impossible even these days and even with a loaded bike. And then the country is at your feet. All over Britain are “transition towns” where people are setting up different projects and making an effort to bring their community back in line with the right principles. Your journey through these towns, staying at their campsites around about, eating at their cafes and soaking up their local architecture and buildings is a real tribute to them. They don’t really want you arriving in a large, polluting car – their streets cannot cope. They will welcome you as a real traveller on your bicycle, ready to meet you eye to eye as a fellow human being, not as a monster laying waste wherever you go. Simple travelling, not costing the earth and a deeply rewarding experience. 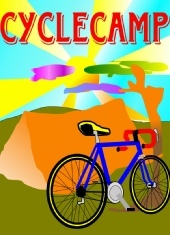 This is cycle camping. Anyone can do it; it is very affordable and simple to do. You can go home knowing that you have discovered another piece of England (or Wales or Scotland) but you haven’t made the earth pay the price for your enjoyment. 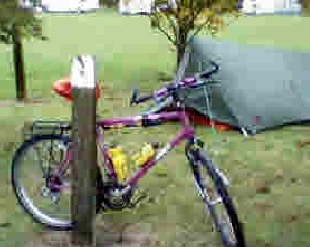 Cycle camping is the best sort of ethical and green travel. You get back home healthier and happier and you know that you’ve done the right thing.